I've recently began commuting to my local station and lock my bike up with a decent Kyrptonite U-lock. I think it is sufficient but I was curious if there is anything better available. I have read that these can be easily compromised but not sure if that is accurate. Thanks in advance. Certainly including use of a second lock of a different style(i.e. cable lock) would serve as an adequate deterrent to all but the most determined thief. The best lock for you is the one you can carry easily, use easily, and thwarts the thieves in your area. You have to know your area. In some areas, the simplest, easiest-to-break cable lock suffices. In other areas, you need the top of the line U-lock on the frame and one more for each wheel. Some use enormous heavy chains, and even that is not a guarantee of safety. Talk to the locals or observe what people use. If you are commuting to a suburban train station, chances are something in the middle will suffice, but it depends. Is it possible to not park at the station, but rather to park in an even more secure location at your destination? My office building has a key-card access video-surveylance equipped cage in the security-patrolled parking garage for use by cyclists. Inside the cage is a set of racks to lock up to. I leave a good lock there. Costs me $10 per month for key access, which additionally includes access to a locker room with showers. My company pays for my light rail pass, so I bike to the station, board with my bike, get off 100 feet from my office building, park in the secure parking, clean up, and go about my day with some peace of mind. I mention all this because leaving the same bike in public view day after day, if it is a nice bike, will make it a target that a well equipped thief will find a way to take. One lock, two, three... Any lock can be defeated with the right tools in minutes. Multiple locks just require more minutes and possibly more tools. Last edited by daoswald; 02-09-19 at 06:19 PM. It’s basically a matter of how thick it is to cut. I have read that (my Kryptonite U-lock) can be easily compromised but not sure if that is accurate. Hey, gpisca! Lock picking a bike lock in the real world is very, very rare and unheard of back in the day. When Kryptonite redesigned and improved their next generation of U-locks back in the late 1980s, they put more manufacturing cost into the steel and less into the lock mechanism. Now, back in those days a popular, less expensive lock mechanism for vending machines, washaterias and bike locks was the cylinder lock. 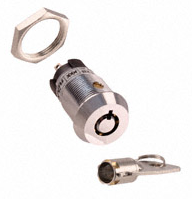 A cylinder lock has a unique vulnerability called 'impressioning'. It just so happened that Kryptonite accidentally picked a cylinder lock that could be impressioned with the plastic body of a common Bic pen. You could jam the old pen body into the lock, twist it and the lock would unlock. Yeah, so like I said, this was all 25~30 years ago, Kryptonite made good on the locks back in the day and lock design has long since moved on. This doesn't prevent anyone from trotting out the old mythology and falsely claiming it still applies to the vastly improved Kryptonite locks of today with completely different lock designs. Can today's locks be picked? Sure can, and you'll find on YouTube videos of lock picking hobbyists with expensive, custom made tools, sitting comfortably at chair height working at a desk with good lighting can get a quality bicycle U-lock open in two to three times as much time as it takes to saw through the steel with an angle grinder. A bicycle left in a public area can't be made theft proof, but even in high theft areas with experienced thieves, you can take solace in the knowledge that you don't have to outrun the bear, you only have to outrun your buddy. The best U-locks engage both legs of the U (as opposed to only one leg) with the bolting mechanism, which makes them more work to remove with a pry bar or jack. Not every Kryptonite has this feature, which they refer to as "double-deadbolt" design. I've successfully parked a pretty decent bike all over Boston for years (but never overnight) with an Abus Granit X-Plus lock on the frame and additional cable for the wheels and seat, but I sure wish the damn thing was lighter! But as others have written, you have to make your own risk assessment and then choose your preferred solution when your research is complete. Last edited by Archwhorides; 02-10-19 at 03:53 PM. Honestly. I don't like subscriptions or payments as I only like to pay once and be done with it. Thus, I don't go for special secure areas. Also, I always stop 1-2 times on the way home from work (pub/market/etc...), which is where the bike gets stolen. I just look at the VdS rating of a D-lock that I can fit around my handlebar/in my 20L backpack. That's VdS (German) and I just simply by a lock they rate as Klasse A+ (best class). Not all Kryptonite locks are created equal. The New York and Fugetaboutit locks are Kryptonite's heaviest locks. They also have some rather heavy security chains that are supposed to be tough to cut. Don't just buy Harbor Freight security chains because they look the same. OnGuard, and a few other brands have similar shackles. I dislike the heavy locks, but am happy to find my bicycle where I left it. There are several lighter locks. It may depend a bit on what kind of stopping you are doing. 8 hours a day in an unsecure place vs a few minutes at a store? And, of course, the value of your bike to you, and the desirability to a thief. Part of locking a bike is also how you lock the bike. Snag 1 or 2 wheels + frame + a post or bike rack with your U-Lock. 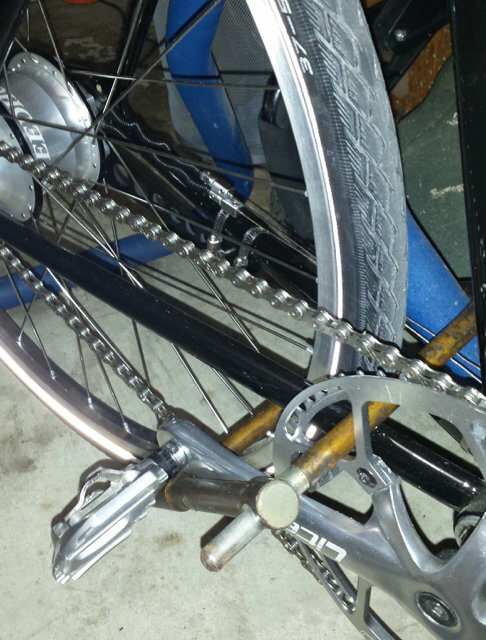 A cable, chain, or second U-Lock can secure the second wheel in high risk siituations. Various quick release locks? Seat locks? Component locks? Plus if it locks on both legs of the U, typically two cuts have to be made to defeat the lock rather than just one. Not all Kryptonite locks are created equal. The New York and Fugetaboutit locks are Kryptonite's heaviest locks. There's a school of thought that once you get up to the quality and size of U-lock that can't be nipped with bolt cutters, a prospective thief will have to resort to an angle grinder. If and when the thief commits to breaching bike locks with an angle grinder, progressively heavier locks only buy some additional seconds of cutting time. Ergo, no real need to spend the extra dosh and carry the extra weight of the Fahgettaboudit over the Evolution. Shrug. You pay your money and take your chances. Last edited by tcs; 02-10-19 at 11:49 PM. That may well be a point, although a double bolt U-Lock in theory takes 2 cuts to get free. There are videos of attacking "ordinary" U-Locks with either 36" bolt cutters, or a prybar. And I've heard of cryogenic attacks. There is also a video of an epic failure of trying to cut one of the Kryptonite NY locks (not sure which one) with a hydraulic bolt cutter. Anyway, there is probably a level of lock that is invulnerable to ordinary attacks, and must be removed with a double cut angle grinder, or a torch. How many thieves are actually running around with grinders? I’ve looked in the BF archive before and recall finding only a couple of reports. The YouTube videos make it seem like a lot but it’s almost always a stunt, not about how the lock can be cut but about how no one challenges the cutter. Here, it's usually a stray bike and bolt cutters that fit into a sack. I think that the CCTV would catch anyone with an angle grinder. Also, use common sense, do leave it locked up overnight where it will be easier to steal. During the day it should be fine though. As said above it can't be made thief proof unfortunately. But be smart about it, always lock to something that can't easily be cut or destroyed. Kryptonite U lock is what I use, put an extra cable lock around both wheels if you are really worried, that should be enough most times to deter a thief. How many thieves are actually running around with grinders? Dunno, but I think it's fairly rare. I look around at other locked up bikes and the standard job is pretty pathetic. A full time bike thief could stay busy with no more equipment than a pocketable ratcheting cable cutter. I had a bike stolen in the summer of 1977. That fall I bought (a replacement bike and) a then state-of-the-art Citadel U-lock. It was my principle lock until 5 ~ 6 years ago, and I still use this 42 year-old U-lock on occasion. Sure, it could be picked, cut or jacked, but why bother when there are as nice or nicer bikes locked up nearby, secured with cables? ^^^ I should look if there's a lock thread (not a locked thread or threadlock) in the C&V forum. That seems like a fun topic especially if we can see some things from before the boom. Wow... Thank you all for the priceless information. I never knew there were so many different ways to use my U-lock. I've had 3 bikes stolen in the last 9 yrs. All were lost due to depending on a cable lock. When the first was lost the security guard at the college told me that nobody took bikes locked with a U-lock. So I got one. Almost 4 yrs later I stopped at a usual stop for a chocolate milk on a hot day. When I came back out 2 min later the bike was gone. The third bike was lost a few yrs later. The U-lock wouldn't fit around a street lamp so I used the cable lock. I did use the U-lock to lock the rear tire to the frame. That was a breakfast stop. This time they didn't cut the cable but the lock on the cable. They took the U-lock with the bike. So far the security guard was right. The U-lock hasn't failed me yet if the bike was locked securely to something stationary. You don't want to have the nicest bike on the rack. I see a few bikes locked up each day at the commuter station near me. They are all beaters. Converting to hydraulic braking system?